How Do I Make My Small Kitchen More Functional? | Cabinet FAQs | Merit Kitchens Ltd.
We understand a diminutive kitchen can seem challenging for channeling your inner, culinary artist. Your kitchen, however small, may also serve as your primary hub for social gatherings. Size limitation should not restrict functionality. With the right renovations, you can turn your kitchen space into an efficient and engaging environment that you and your guests will enjoy. When redesigning your new kitchen to improve functionality, you’re going to have a lot of questions. Do you need to reshape your existing design? Can your cabinet space be optimized to fit more kitchen items? The key to selecting a small kitchen design that will suit your space-challenged room is knowing its hidden space potential. At Merit Kitchens, we assist homeowners with their small kitchen design by optimizing every square inch of space to maximize usability without compromising style. We can perfectly blend both form and function, even in small spaces, to create a truly remarkable kitchen theme for your home. Always use your corner space and utilize Magic Corners, LeMans units, or Lazy Susans to access the space. Maximize your storage by using interior fittings and drawers so items don’t get ‘lost’ in the back of a cabinet. Maximize your vertical space by having wall cabinets reach to the ceiling. Try to squeeze in a pantry, even if it is just a small pull-out one. Look at your existing space. Can you turn a closet into cabinetry with roll outs? Use smaller appliances if possible. Use a microwave/hood fan combination. Or consider eliminate the microwave completely if it is not used frequently. Increase the depth of wall cabinets from the standard 12” to 15”. Don’t neglect the storage above your fridge. Install a 24” deep cabinet over it to store less frequently used items. It’s also a perfect space to install vertical dividers for cookie sheets and muffin tin storage! This may also be a good time to re-evaluate your kitchen’s theme. What style and colour will best suit your small kitchen area? Do you want a contemporary design or something more traditional? Although these questions may seem daunting at first, they can be answered quite easily, especially when you have Merit Kitchens’ expertise on how to make your kitchen more functional. 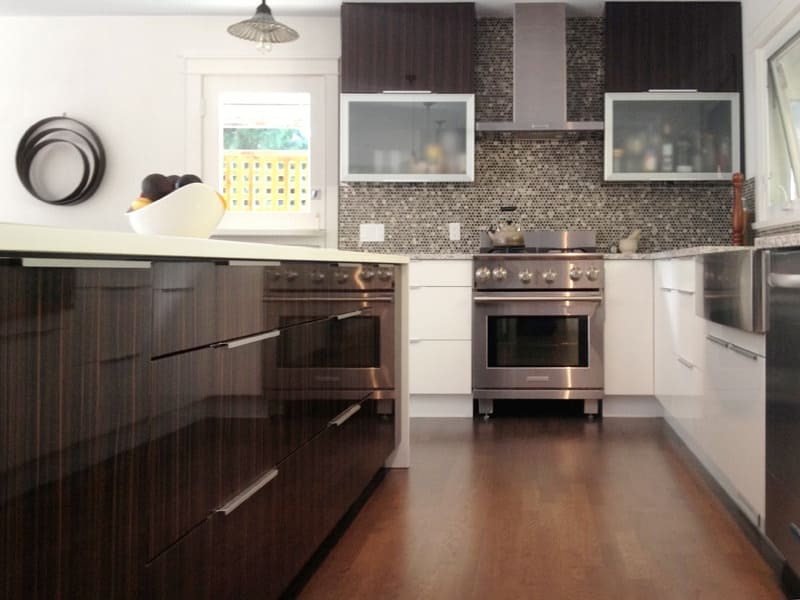 Founded in 1971 in Vancouver, British Columbia, Merit Kitchens has grown from being a local cabinet manufacturer to becoming a proud distributor across Canada, the United States, and Japan. We offer an extensive selection of styles that suit small spaces. If you have a design of your own, we can build it. Submit your specifications and dimensions to us, and we’ll bring it to life! All of our kitchen and bathroom cabinets are constructed using only premium, environmentally friendly raw materials. Thanks to German engineering techniques our cabinets are made to last a lifetime. We’re so confident in their durability, we offer a limited lifetime warranty to you. Next time you find yourself asking, “How do I make my small kitchen more functional?” give our customer care team a call. We’ll be happy to answer any questions you may have about optimizing the functionality and usefulness of your kitchen space!